The misery of flooding will be a thing of the past for most of Elgin’s homes and businesses following practical completion of the £86million flood alleviation scheme. 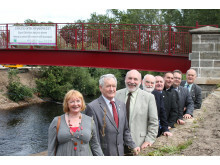 The final piece of engineering, a footbridge over the River Lossie, was formally opened yesterday (Tuesday). Completion of the bridge means that the level of flood protection provided by the scheme for homes and businesses along the Lossie is now in place. All that remains is landscaping and ancillary works. 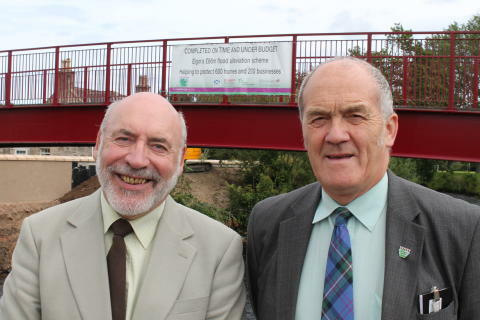 Speaking at the opening of the bridge, the Leader of Moray Council Cllr Stewart Cree said it was a momentous day for Elgin. “This is Scotland’s biggest-ever flood scheme to date and the largest civil engineering project undertaken in Moray, and I’m delighted to say it’s been completed on time and nearly £3million under budget,” he said. “Today marks a milestone in the history of Elgin, and brings to a conclusion a decade of planning and construction work over the five flood alleviation schemes in Moray. The Lossie Wynd footbridge provides a safe pedestrian link between the town centre and Bishopmill, avoiding the pavements on the busy A941. 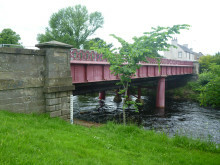 The old footbridge had a centre support and created a pinch-point in the flow of the River Lossie. It has been replaced with a single-span bridge across a widened span. Balustrades from the old bridge are being used in landscaping of the entrance to the bridge. An extra benefit of the scheme has been the creation of a safe cycle route through Elgin, and will eventually create a three-mile link between it and Lhanbryde. Elgin is one of Scotland’s oldest towns and has grown along the banks of the River Lossie for over 900 years. The River Lossie, drains an area of approximately 270km2 - almost as big as Malta - to the sea at Lossiemouth. Flooding in Elgin dates back 250 years, with 11 floods in the last 50 years. Most recently Elgin flooded in 1997, 2000, 2002 and 2009. On 11 August 2014 - whilst only partially completed - the scheme protected approximately 270 residential and 75 business premises from flooding, avoiding damages worth an estimated £29 million. During major flood events in Elgin, key transport links that serve the north east of Scotland are severed. During both the 1997 and 2002 flood events the A96 trunk road was closed for more than 48 hours, whilst the Inverness to Aberdeen railway line suffered considerable damage and was closed for several weeks. In 2002 over 200 households were evacuated and 10 people had to be airlifted to safety. The preferred scheme for Elgin was selected at a special meeting of the Moray Council on 25 February 2004. A Flood Prevention Order was publicised in October 2007 and a planning application submitted in January 2008. Scottish Ministers confirmed the scheme in December 2010, with construction starting in April 2011. Five residential properties and twelve commercial properties were demolished to create the space required for the new, wider river corridor. The scheme is designed to provide a 1-in-200 year standard of defence. Flood protection for Elgin now complete with the opening of the last bridge over the river Lossie.